Can the French PMP maker stay ahead of the iPod? The last decade has been pretty important for portable devices. The coughing, spluttering death of the MiniDisc player brought at end to an age of CD players and Walkman tape players, and into the spotlight stepped digital content. And not just MP3 either; soon video, pictures and mapping functions became the norm in standalone devices, and more recently mobile phones too. But amid the confusion of iPods and digital cameras and stonking great GPS handsets, digital video formats went from a barely heard about idea to being as important as MP3 playback. And some of that success has to be apportioned to Archos, a French company that pushed quickly from MP3 to video formats, and made the world sit up and take notice of the fact they could watch all the stuff from their TV on the go. "Our technology keeps us ahead of the competition," says Tony Limrick, MD of Northern Europe for Archos. "If you look at our products against other brands, then they are ahead of the others. If we don't stay ahead then we will lose our market lead." We had a chat with Limrick to find out how Archos intends to keep innovating in a congested market, how it plans to improve its range of PMPs and, most importantly, how it intends to beat off the threat of Apple's shiny gadgets. Is the MP3 market still important to you? If you look at the market for MP3, the price is quickly declining, where MP4 is a growth area. The mass market now understands that they can do with their movies and DVD what they could with their music. The challenge is making sure we stay ahead of the competition, and doing what we say we are going to do. If you take Archos, our brand awareness is growing more than ever before. I've only been here 20 months, and on at least 30 occasions someone has come up to me and asked about the unit I'm using. How do you deal with new competitors [i.e. Apple] entering the PMP market? There's always going to be competition, which is a good thing for the market. Smartphones are starting to put moving images into people's pockets, and there's a real convergence of different technology, i.e. the mini PC, smartphones with GPS and multimedia players. We're doing the same thing, if you look at the GPS cradle we launched that converts our devices into GPS systems. How do you deal with phones coming into Archos' PMP market space? When you get convergence on a device, you have to have a compromise, and it's working out how much compromise the user is willing to accept. Look at a smartphone, does a user want to watch movie on a screen that small? 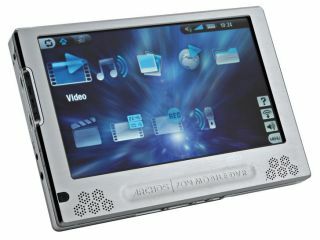 I'll always pick up an Archos to watch a movie, for entertainment, because the screen we've got is a great screen. A smartphone doesn't give that unless it's big enough, but then if the phone is too big, you don't want to carry it around. Equally if I use the phone in the office then go to the airport, if I've used the phone a bit once I get onto the flight the battery is dead, and then the entertainment on the smartphone will be inaccessible. But people want convergence and the iPhone brings that closer, why is there no Archos phone? It's a decision that's been made at head office, though it's not a conversation I've had with the R&D team. I think the answer would be that we both support and like convergence and I think the Internet Media Tablets show that Archos welcomes that.